Driving through my neighborhood in the summer, I can count on seeing a few things: people mowing their lawns, garage sales set up in driveways, and entrepreneurial youth with lemonade stands on the sidewalk in front of their homes. You can’t say no to lemonade being sold by smiling kids, particularly not at the low price of 25 cents a glass. I have a secret, though – I usually don’t drink the lemonade. Country Time has made quite a name for themselves, however I much prefer lemonade with a little more love. To me, lemonade should have a delightful sweet and tart balance, with at least a bit of fruit pulp so you know you’ve got the real thing. That’s why I love this recipe. The only thing better than an ice-cold glass of lemonade on a summer day is when that lemonade has additional perfectly ripe seasonal fruits mixed into it. Nectarines and strawberries are both fruits that are at their best in the midst of the dog days of summer. Their juicy sweetness perfectly pairs with the tart and refreshing lemon juice. Once you give this recipe a try, you’ll never go back to another! 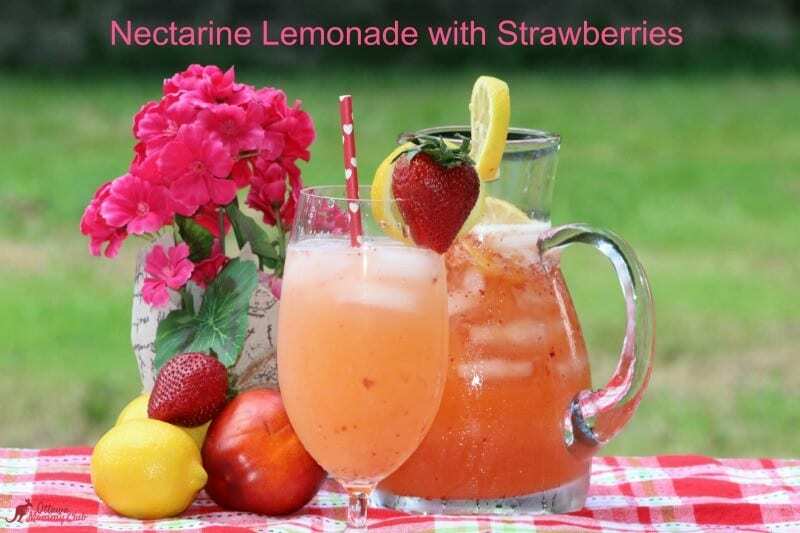 A sweet and refreshing lemonade recipe using nectarines, strawberries, freshly squeezed lemon juice and agave. Enjoy! Pour the pureed nectarine and strawberry juice through a mesh strainer to remove any chunks of fruit. Pour water in a large pitcher and add nectarine and strawberry juices while adding lemon juice. Stir well to blend, add agave, and stir well again. Put ice in each glass, pour the nectarine lemonade with strawberries into the glass, and add a fresh strawberry in the glass or on the edge of the glass. 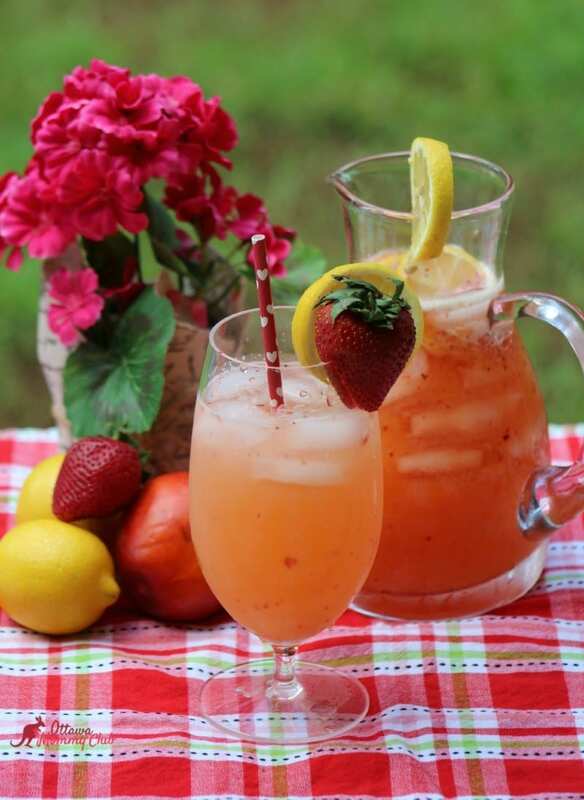 I hope you enjoyed my Nectarine Lemonade with Strawberries recipe as much as my family and I did. If you make it, make sure to share with us on Facebook or Twitter! Also, check out all of our other Recipes. Yumm! This sounds perfect for a hot afternoon; tasty and refreshing! Thanks for the recipe! this sounds heavenly, wish I had a glass of it right now. Thanks for sharing the recipe. The kids would love this one,going to give it a go when we get a hot day! This looks so cool and refreshing! Would def be awesome to bring to a picnic sometime. thanks! Nectarines….I never remember to include this fruit in recipes. So tasty and refreshing! Fantastic recipe! That sounds so tasty and refreshing. easy to make and sounds and looks so refreshing! Thanks for the recipe. This sounds so delicious!!!! This sounds delicious! And so refreshing! Thanks! This sounds great!!! Would make a great punch for a christmas party too! This is so perfect for the spring and summer months especially.It looks so refreshing and delicious. I must try to make this this summer – here’s hoping we have a decent one after this frigid winter that never seems to want to end.